Chinese mobile giant Huawei will spend £3 billion over the next five years on procurement in the UK. This means the firm will spend money on anything from chipset IP to financial services from British-based companies. The deal looks good for a post-Brexit UK that needs to prove it’s an important trading partner to the rest of the world. Huawei, the Chinese smartphone and telecoms giant, has promised to spend £3 billion over the next five years on buying technology, intellectual property, and services from the UK. Huawei has described the promised cash as a procurement commitment, meaning it will source anything from chipset IP to financial services from UK companies, both for its UK business and for the group more widely. The announcement comes after Huawei’s chairwoman, Sun Yafang, met with UK Prime Minister Theresa May in Beijing at the end of January. Huawei isn’t revealing much detail on where it plans to spend the money at this point. It’s likely the cash will go towards buying licences from UK-based and Japanese-owned chipmaker ARM for HiSilicon, Huawei’s chipmaking subsidiary based in China’s Shenzen. It might also involve procuring services for Huawei’s global financial risk centre, which is located in London. Business Insider understands that Huawei will make a separate announcement around investing more money into more staff and offices in the UK. The investment will be a welcome sign of confidence in post-Brexit UK, and positive news for tech firms looking to get their products into China. 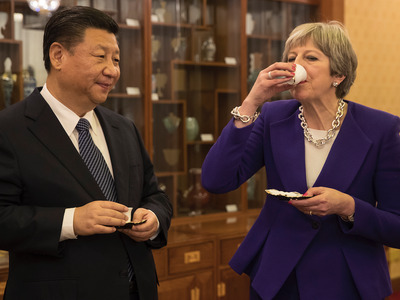 It’s also a good sign for Theresa May, who headed to China shortly after becoming prime minister last year to push for better trade relations. Huawei has been operating in the UK for 17 years, a spokesman said, and has established partnerships with BT, a research centre in Ipswich, and the “Cell” security centre in Banbury. Huawei employs more than 1,500 people in the UK across 15 offices. The news comes even as foreign governments become increasingly suspicious of Huawei, and any possible connections to the Chinese government. The launch of Huawei’s latest flagship, the Mate 10 Pro, was scuppered in the US after a carrier deal with AT&T fell through, apparently after political pressure. The US Senate and House intelligence committees reportedly sent letters to the Federal Communications Commission arguing that Huawei was a security threat. The UK’s Intelligence and Security Committee expressed similar fears in a paper in 2013, but Huawei has allayed any worries around security somewhat with the Cell, where Huawei staff check the firm’s equipment for security bugs. The unit is overseen by UK government and security officials. Huawei chairwoman Sun Yafang said: “Huawei values long-term partnership. The UK was one of the first international markets we entered, when we opened our first office there in 2001.